“The Prince of Wales is delighted to announce the engagement of Prince William to Miss Catherine Middleton.” With this official press release, Clarence House announced today that Prince William, second in line to the throne, will marry Kate Middelton in 2011, the year that would have been the 30th anniversary of his parents’ wedding. It was also revealed that the couple became secretly engaged in October during their holiday in Kenya. According to the BBCs correspondent Will Ross, Prince Williams popped the question at a game reserve in the foothills of Mount Kenya, where he stayed several times. He also spent part of his gap year in Kenya and therefore is very fond of the Country. The Prince didnt initially present a ring when he asked for Kates hand, but later gave her the Engagement Ring of his Mother, Princess Diana. 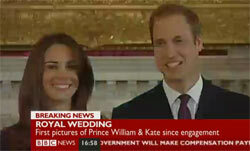 British Prime Minister David Cameron already sent the couple his very best wishes. Buckingham Palace has stated that Britain’s Queen Elizabeth is”absolutely delighted” for Prince William and fiancee, Kate Middleton. Prince William and Kate Middleton appeared before the cameras on Tuesday afternoon at 4:45 pm local time for a short interview. This was the first public statement of Ms Middleton ever. She remained so restrained during her time with Prince Williams, that Britons haven’t even heard her voice up until this official press appearance. This was written by admin. Posted on Tuesday, November 16, 2010, at 6:39 am. Filed under Kate Middleton, Prince William, Wedding. Tagged 2011, Clarence House, Engagement. Bookmark the permalink. Follow comments here with the RSS feed. Both comments and trackbacks are currently closed. Congratulations to a beautiful couple, a Royal Wedding will bring a smile to Britain’s face. Absolutely wonderful news, congratulations from your fans in South Africa. It seems to be quite a coincidence that The Beatles FINALLY released music and movies on iTunes the same day that these two FINALLY announced their engagement. It wouldn’t surprise me if the British Royals controlled Beatles copyrights and royalties. Who knows? They may be planning to fund the party with royalties from iTunes. Congratulations to the both of you, all the best for the future. Just want to add one thing, even though im really happy for you both, please, please dont book 17th june as this is my wedding day, cant afford a lot, but want the few guests to be talking about me on my day not you. Sorry to be selfish. I am very proud and happy for both couple.May your day be filled with joy and happiness. Congratulations to the new couple.From Papua New Guinea. Is it a criteria when marrying into the royal family that you have to shoot and kill animals and birds etc. Did Kate and her family have to do this. If I was told I’d tell them to get stuffed. Who wants to marry killers. The Royal wedding should be with the people and be more central and away from London. They should be wed in most likely York Minister, which is a beautiful Cathedral, and is central in the UK. Finally!! They seem so much in love! May God bless your marriage! I have one of the limited Royal Mint coins of Prince Charles and Princess Diana still in its case, and I’m looking forward to getting one of yours! Congratulations to William and Kate. I wish you many happy years together. Model your marriage after William’s grandparents. They seem to know how to stay married.